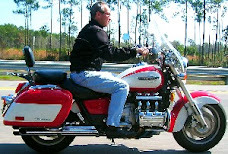 Musings of a motorcyclist - why I ride? This phrase is most often heard when non-motorcyclists ask motorcyclists why they ride. It strikes me as a cop out response. When I use it I feel inarticulate. Why can't I explain why I ride? Why won't a non-rider understand? I've hinted at motivations in earlier posts: Jan 25th, Feb 6th, and 14th. So, while passing the policeman on the HOV lanes I got to wondering how to answer why I ride. My head started to hurt so I quit thinking about it. About then I noticed spring is coming. The air was crisp, the sky blue, and even in the midst of way too much traffic I spied a daffodil on the side of the road. Heading north on the George Washington Pkwy I noticed the Potomac with a wisp of fog indicating the presence of a temperature difference between water and air, albeit ever so slight. Continuing I could see buds on some trees promising to hide the expensive homes grossly in view when the trees are winter-bare. It was nice to ride and be given the promise of spring. The 66th annual Bike Week is in full swing. To celebrate, I rode to work on my Valkyrie yesterday. It wasn't quite the same thing.